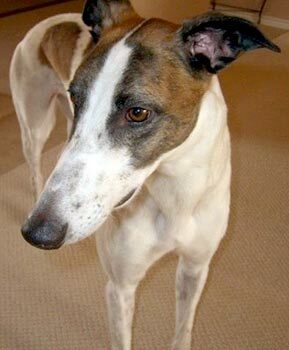 Clown, aka Kansas Clown, is a handsome, 6-year-old, white and red fawn brindle male, born July 19, 2003. His sire is Craigie Whistler, making his grand-sire Molotov, and his dam is Kansas Calypso, making Dapper his half brother. Clown raced from May 1, 2005, to September 21, 2005 in Dubuque, Iowa. 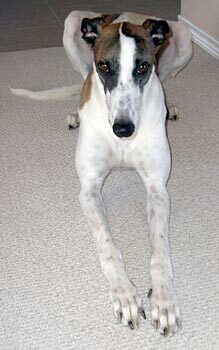 He came into the GALT family on December 10, 2005, and was adopted into his forever home on January 28, 2006. Clown was dearly loved and cared for by his dad, Kitt. Sadly Kitt died following a lengthy illness on October 12, 2009. Clown is back to his GALT family, and is adjusting okay. It is not known at this time if Clown is small animal or cat tolerant.